December 6th, 2007, HOLLYWOOD. This week The Gnomon Workshop will release a two volume series from Gnomon Founder and Director, Alex Alvarez; Character Modeling in Maya and ZBrush: The Making of Jester, Volume One and Character Texturing and Rendering: The Making of Jester, Volume Two. This making-of demonstration and lecture began with the decision to take a personal sketch, develop it in 3D and produce a life-size print. This would require the development of high-resolution detail and textures that could hold up to a 4000x6000 pixel render, effectively making Jester a film-res character. Observe and listen as Alex shares his workflow, thought process and techniques. This comprehensive set takes the viewer through the complete creation process from Base Mesh creation through to environment creation. Alex will work through such topics as UV Layout, Composition and Lighting, Maya Shader Setup, Rendering with Mental Ray and Maya Workflow, just to name a few. Also this week The Gnomon Workshop is pleased to be releasing Character Rigging: The Puppet Rig, Maya Rigging Techniques with Carlo Sansonetti. Italian-born Sansonetti has created a name for himself over the past several years as one of the premier talents in the CG industry. Having worked in feature films as well as with National Geographic, Carlo most recently lent his talents to Heavy Iron Studios. In this detailed tutorial, Carlo takes you through the entire rigging process from skeleton creation and joint orientation through to limb twisting. Topics include Animation Controls, Stretchy Spine and Head and Neck rigs to name a few. "Whenever I need to breathe life into my characters, Alex Alvarez is where I go. Whether it be to collaborate on concepts with him directly or to watch his DVDs, I am always confident in accessibility to great information. Not only has his technical prowess pulled me out of many holes, but his character sense has given rise to some wonderful moments on some major motion pictures (Avatar and Star Trek). These new DVDs encapsulate what I gush about. Crazy and creative character design coupled with empowering technical know how." "Carlo is the master at creating robust character rigs that have feature film quality on a video game budget. He knows the rigs, he knows animation and he never stops impressing us with his ability to blend this knowledge into amazing results. Frankly, our job would be impossible without Carlo. He is a marvel!" "Carlo Sansonetti is easily the most talented character rigger I've ever worked with - his high quality character rigs and associated productivity tools are a joy to animate with. His technical knowledge, creative problem solving skills and firsthand experience as a production animator provide him with specific insight into the requirements of a rig from an animator's point of view and result in practical, efficient and elegant character control systems. Hopefully this DVD will sell like hotcakes and populate the industry with more riggers like Carlo." Volume One covers the character modeling process using Maya and ZBrush, as well as some lighting, composition and texture exploration. Alex begins by creating an organized base mesh in Maya that accurately follows the 2D design. Using Vlayout, he flattens the UVs of the multiple base mesh components. Jester is then imported into ZBrush for sculpting and detailing. We give some thought as to the resolution for each subtool that should be sent to Maya and export them with normal maps generated in Zmapper. Once in Maya, the shader networks are blocked-out so that Jester renders in Maya with the same level of detail that he had in ZBrush. The final step prior to texturing is to then create a Photoshop color study that will guide our further progress on the character. This comprehensive 2-disc set has 9 hours of lecture. Volume Two covers character texturing and shading using Photoshop, ZBrush, BodyPaint and Maya, as well as environment creation, lighting and the final composite of the print-res image in Photoshop. Jester's 2D line-drawing design does not specify material properties, therefore Alex explores different looks for the various components, settling on weathered leather, metal, cloth and skin. By layering, color correcting and painting over photographic textures, Alex arrives at a photoreal result where each component has its own custom color, bump and specular map. With the character complete, the environment is then designed and created on the fly using Maya and Photoshop for some quick paint-overs to guide the direction. Throughout the making of Jester, Alex shares and explains every step of the process, both technical and aesthetic, making this an invaluable resource for both students and professionals. This comprehensive 2-disc set has over 10 hours of lecture. Alex Alvarez is founder and director of The Gnomon Workshop and of the Gnomon School of Visual Effects in Hollywood. Having dedicated the last decade to educating students and professional artists around the world, Alex has helped change the face of computer graphics and design education. He has been published in industry magazines, websites and books - plus he has taught courses at several major trade conferences. Alex is president of the Los Angeles Maya Users Group and sits on the Advisory Boards for Highend3D.com and CGSociety. He continues to work on personal and professional projects, recently as a creature development artist on the James Cameron film Avatar. Prior to Gnomon, Alex worked for Alias|Wavefront as a consultant and trainer for studios in the Los Angeles area. Alex is an alumnus of the Art Center College of Design and the University of Pennsylvania. In this DVD, character rigger Carlo Sansonetti demonstrates the rigging process from research to completion. 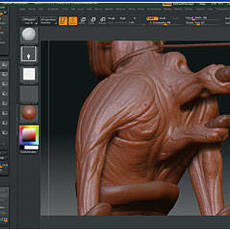 Carlo covers creating the skeleton and rigging the spine, arms, hands, legs, head and neck. He discusses the core concepts of rigging, including joint orientation and understanding rotation order, as well as some more advanced techniques like stretchy limbs, forearm twist without volume loss, and connecting attributes with Hypershade. This DVD is for students who are new to rigging as well as for professional riggers who are looking for different approaches to rigging their characters. This DVD features over 6 hours of comprehensive lecture. An Italian native, Carlo Sansonetti studied Photography at the American University in Rome. Following his dream, he decided to move to the U.S. to study and work as a CG artist. In the past eight years Carlo has worked on several projects as a rigger including Scary Movie 3 and on the National Geographic documentary Fight Science. More recently he completed work as a rigger on the next generation game title Ratatouille for Heavy Iron Studios. In his spare time, Carlo taught at Gnomon School of Visual Effects and created the award-winning animated short film The Auction. Carlo is currently working at Lucas film Animation on the CG animated series The Clone Wars. Since 2000, The Gnomon Workshop has provided artists and students with the educational resources they need to succeed as artists in the entertainment industries. Whether they're interested in design, modeling, effects, animation, storytelling or matte painting, these DVDs provide a valuable educational resource for students around the world. The Gnomon Workshop is the sister company of The Gnomon School of Visual Effects, which provides professional caliber visual effects instruction to students and professionals in Los Angeles, California. Visit http://www.thegnomonworkshop.com for more information on The Gnomon Workshop and our library of over 180 training DVDs.